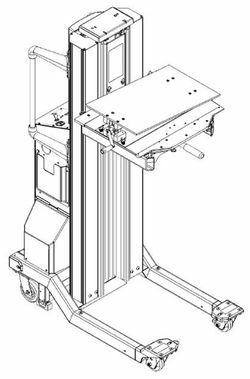 The ServerLIFT RS-500X Rail Lift is a shelf extension module suitable for manually or battery operated ServerLIFT lifters that allows for lowering servers and other rack-mounted IT equipment into sliding rails. It allows equipment with a maximum load of 227kg to be lowered or lifted straight, vertically or at an angle of up to 5 degrees. Therefore the inclinable shelf is also perfect for the quick installation and removal of IT equipment from rails with J-slots. The angle can easily be adjusted whilst in use. For the use in confined spaces or even under difficult installation conditions the multi-pivot handle can be reconfigured. When the RS-500X Rail Lift is used in conjunction with the ServerLIFT SL-350X the maximum load capacity of almost 159kg must not be exceeded.